I have now completed 15 of these blocks, which means that I'm keeping up with my goal of completing 5 blocks a month. Hurray! 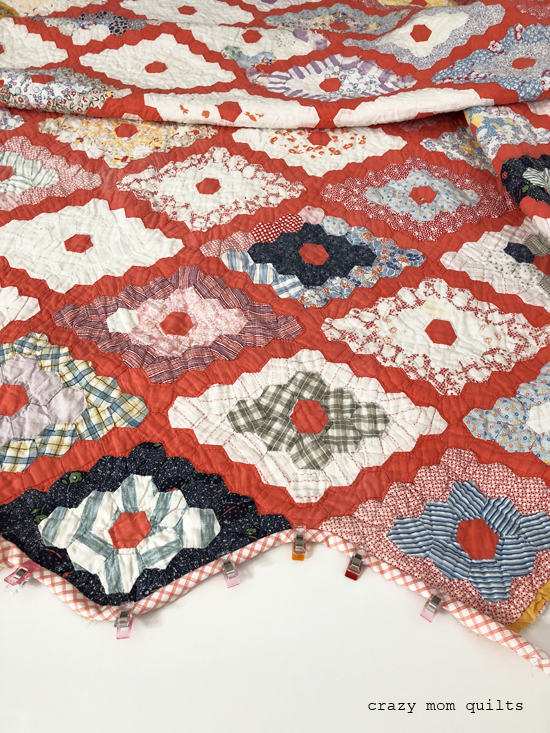 The blocks are English Paper Pieced, so they are completely stitched by hand. Each block takes awhile, but I enjoy the process so much! 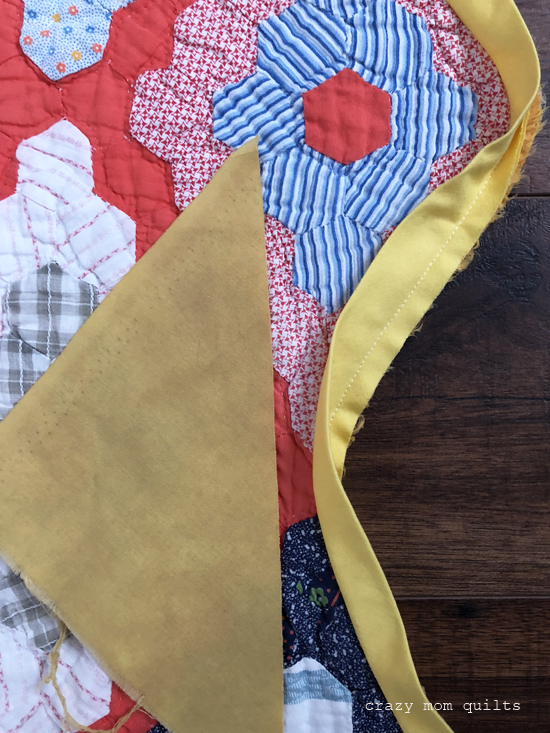 I have not been deliberate about the colors I choose for the overall quilt, rather I'm selecting fabrics one block at a time. This is the first time that I laid them all out together and I'm relieved that they are cohesive, as a group. (I'm using 30's reproduction prints, which all tend to go together, so it wasn't a HUGE risk, really.) I added the scissors in the photo for scale. These blocks are pretty large! That's good news, because that means I need fewer of them for a decent sized quilt. 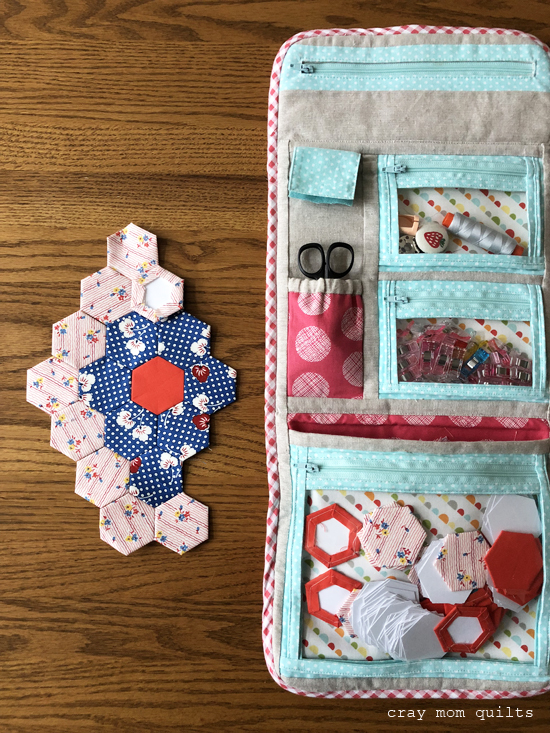 The sew it goes tote that I made awhile back (pattern available for purchase here) is so helpful for containing all the pieces as I work and it makes the project very portable. Plus, it's really cute!!! As you can see, I'm well on my way to completing my next block. I'm hoping that I have plenty of time to hand stitch this weekend. That's it for me today! Now, it's your turn to link up your finishes for the week. Thank you for joining me for finish it up Friday! Have a great weekend! Happy Easter! 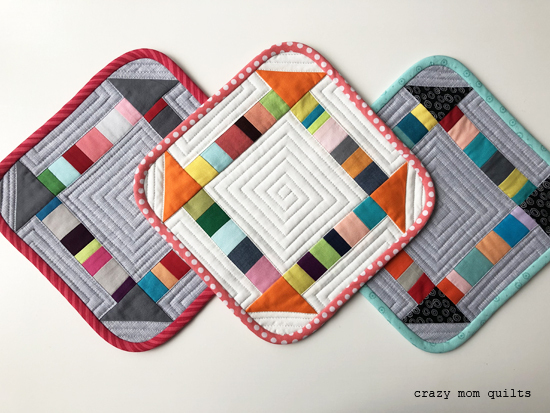 Thank you to all of you who took the time to respond to my binding dilemma in this post. After reading the responses, I felt more confused than ever. There were good points for each option! I figured that might happen, so I decided not to rush my decision. After a few days of ruminating on the subject, I decided to go with yellow after all. Except....I did NOT use the Kona Canary, I went with Kona Buttercup instead. The buttercup color is less intense than the canary color. Now that it's on the quilt, I don't think I could have gotten a better match. It's the right color and intensity. It was also in my stash, which is the cherry on top! Applying the binding around those sharp points was NOT easy. I did the best that I could and decided to not stress over it too much. I could tell that the original maker had a bit of a challenge with it as well, which made me feel much better. 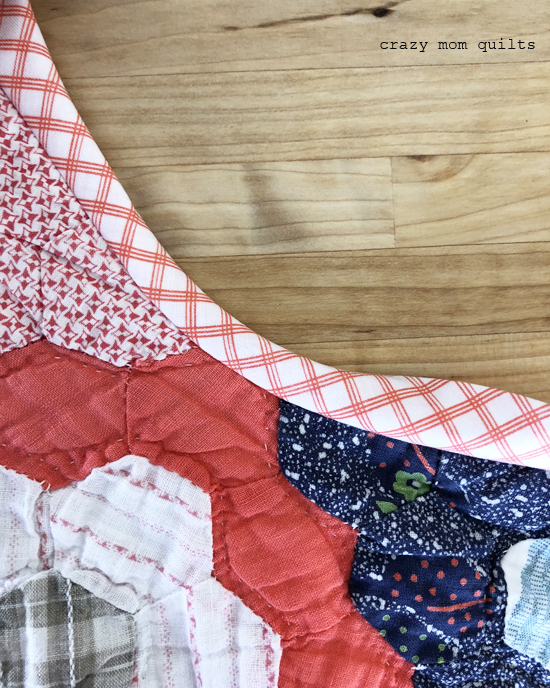 :) I made bias binding, and I ended up using almost 2/3 of a yard of fabric, which felt like a lot for a quilt this size, but with all the extra turns and points, it makes sense. I'm glad I had enough fabric the first time around! 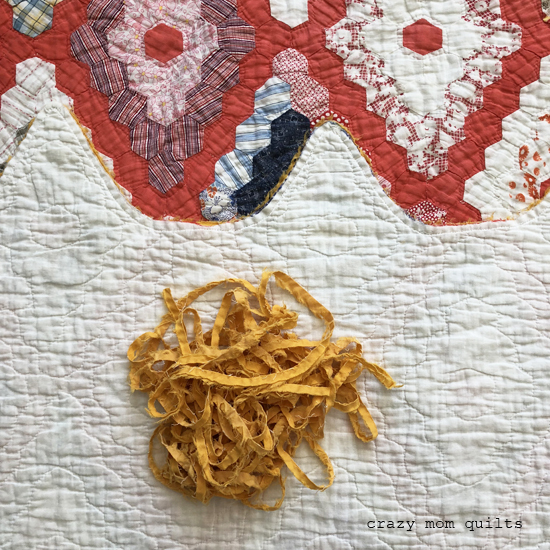 I also tried a tea dyed experiment with the Kona buttercup, thinking that it would tone down the yellow just a bit. In reality, the tea made the fabric look really dirty, so it obviously wasn't the way to go. It was a good test, though. You don't know unless you try it out. At least that was an easy decision! I have only just begun to hand stitch the binding down to the back, but I had to get started to see how it's going to look. I'm very excited to see the fresh new binding on the edges. It's SO much better than the previous tattered edges. I know that I'm going to enjoy stitching the remainder of the binding down. Every single stitch! 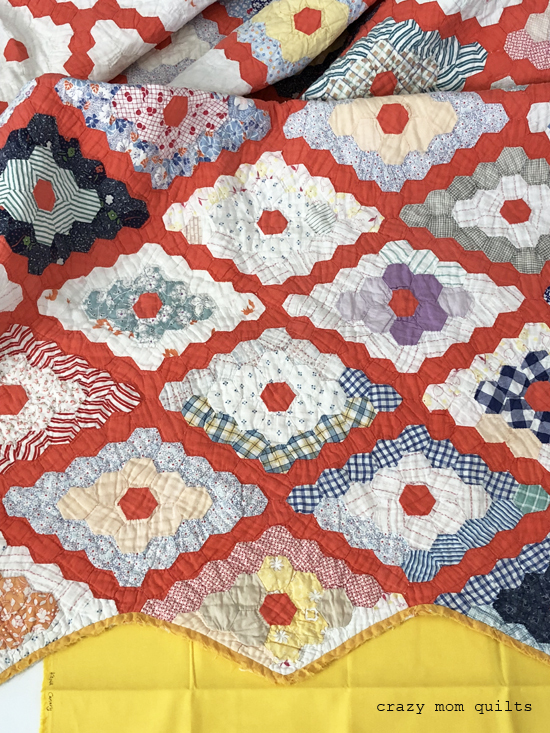 I did appreciate all the comments in the previous post...I took the advice of one wise commenter and pre-washed the fabric before I applied it to the quilt. I wouldn't have thought to do that, so I'm glad that someone pointed it out to me. Thanks for the valuable input! 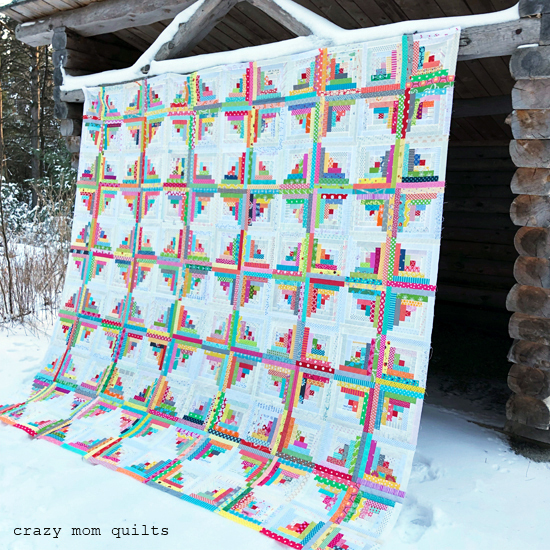 I'm still plugging away quilting my huge log cabin quilt, so that's where I've spent the bulk of my sewing time this week. I did have time to finish up (and gift!) a few items this week, so that was fun! This pouch was something that I made around the holidays, I think, but I finally sent it off to it's new home this week. (It was so nice to have it ready to go!) The fabrics for the pouch were acquired from the free table at a retreat last summer compliments of my friend Jeni. 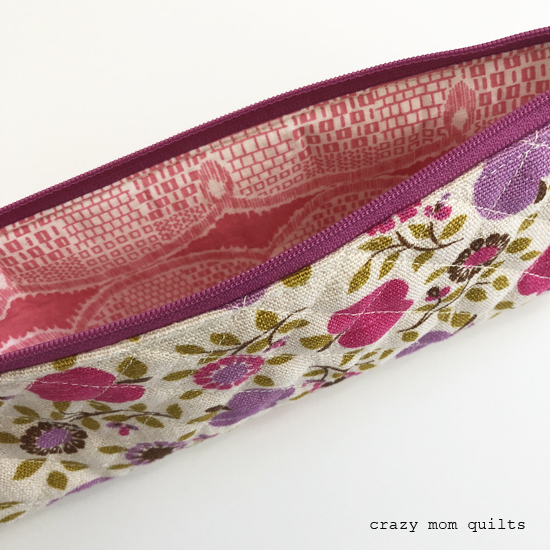 I turned them into this cute little pencil pouch (free tutorial here) and sent it back to Jeni as a birthday gift. I figured that she would like it, since she is the one who purchased the fabrics in the first place! Ha! The exterior fabric was a vintage napkin, originally, and the lining fabric was part of a vintage apron. 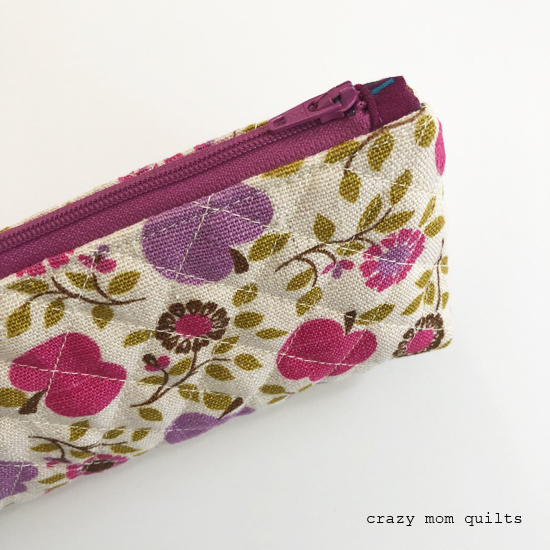 It was fun to repurpose both fabrics to make this pouch. I used my favorite interfacing (Pellon SF101) to add some stability to the lining. Since I didn't have the right size zipper on hand, I added zip tabs to the ends. It worked out great! 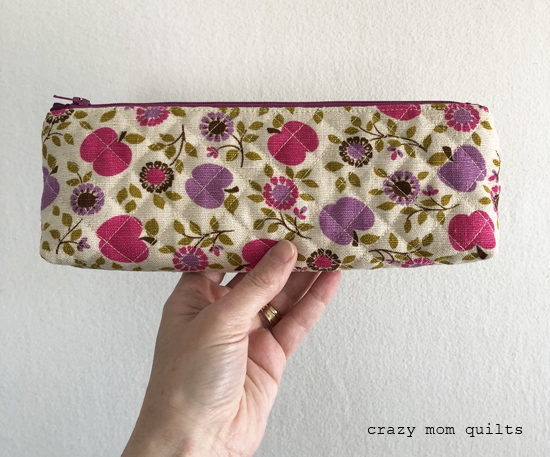 Also, I LOVE a quilted zip pouch. It takes longer to make because you have to quilt the panels, but the texture is totally worth it. Plus, it uses up scrap batting. Gotta love that! I'm happy to say that Jeni loved her pouch. Hurray! I did a little more playing with churn dash blocks. (I still have more ideas to work out...so don't be surprised when you see the next few installments!) This block is 3 1/2" unfinished, so 3" finished. Pretty small, but I still want to go smaller! I think it's a sickness. 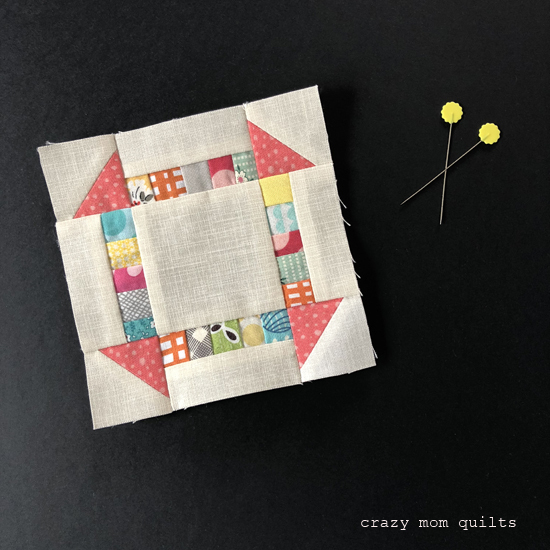 I knew that I was not going to have the patience to make a few hundred of these blocks, so I added a thin outside border (so the points wouldn't get lost around the curved edges) and turned it into a pincushion. I love it so much, it's going into the permanent collection. I used a feedsack fabric that came from my grandma's house on the back, so further excuse to keep it. This is scrap project #200. 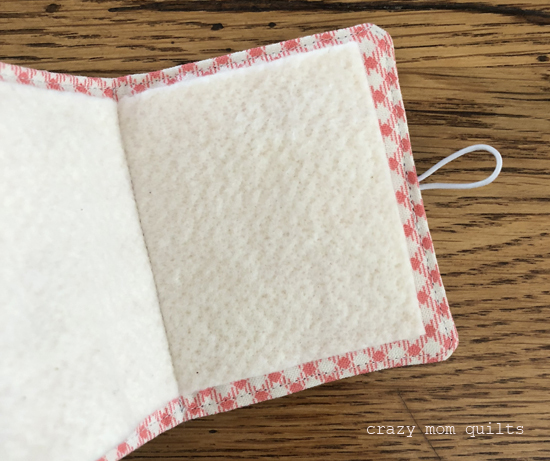 The last project of the day is a tiny needle book. 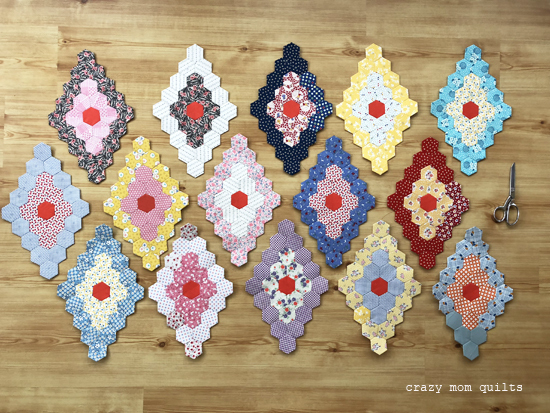 I purchased the blue vintage scraps at an antique store (many!) years ago. It was high time to use them! I love the vintage-looking button to finish it off. I made two of these needle books, nearly identical. 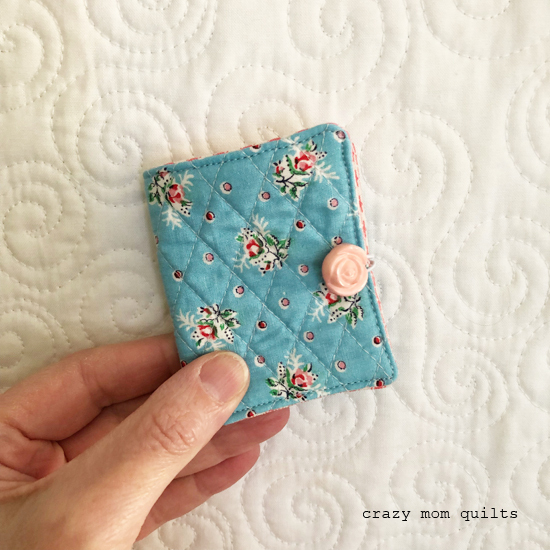 I gave one to my friend Nancy, (who taught me how to quilt!) and I think I will keep the other one. They are so tiny and cute! The interior fabric was from the stash and the pages are scrap batting. The elastic thread that I used for the loop closure was also repurposed....originally it held a pair of shoes together. I love that I can repurpose that elastic thread....it feels sooo thrifty and it works like a charm! :) This is scrap project #201! It's kind of fun that all of my projects included some vintage component in the making. It feels good to use those precious little bits rather than hoarding them. Hurray! This block will finish at 4 1/4". 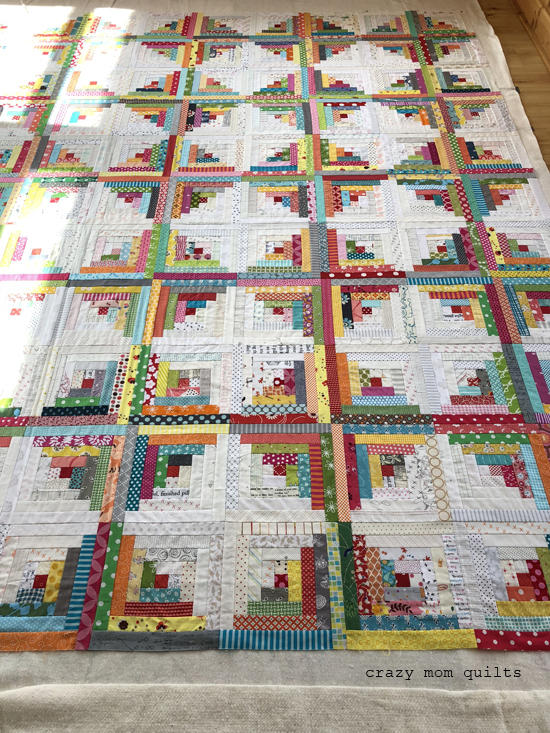 I purposely made it this size so I could combine 4 small blocks and alternate them with one larger block, which will finish at 8 1/2". 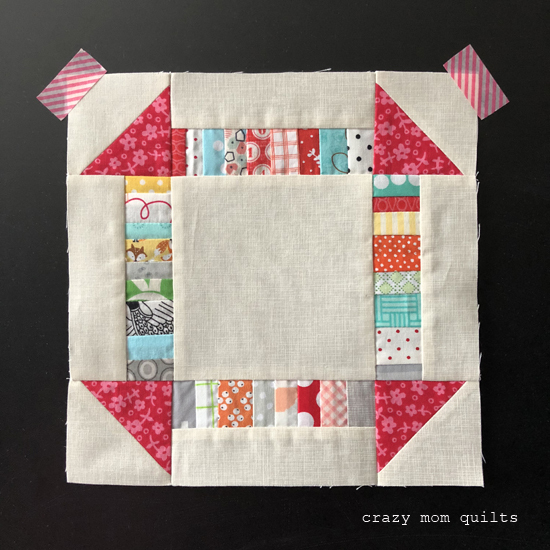 There is a tutorial for the large sized scrappy churn dash block here, if you care to make some of your own. ... and I immediately basted it. It was a little chilly out on my 3 season porch (it was only 37 degrees), but duty calls! Ha! 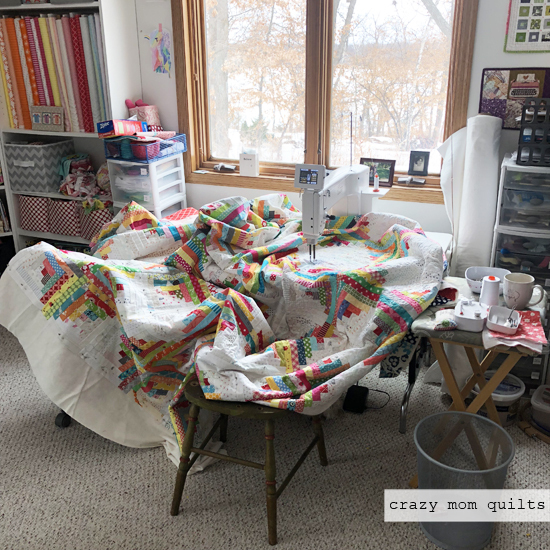 No matter the temperature, it is nice to have floor space to baste a king size quilt. 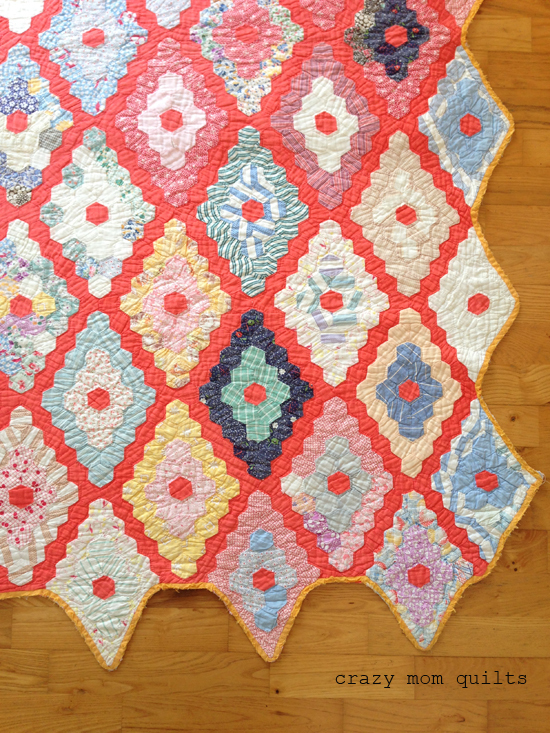 I debated sending this one out to be professionally quilted, but part of me really wanted to quilt it myself. (Maybe I have more stubbornness than good sense? I don't know....) I consulted a few friends and they thought that I should quilt it myself. With their votes of confidence, I decided to jump in and just do it. 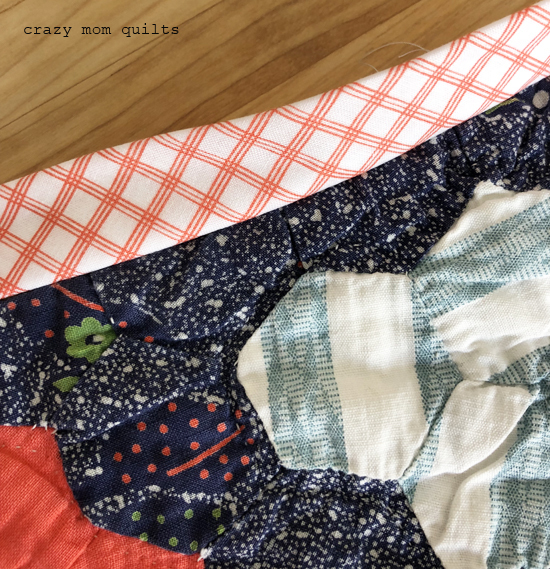 Even though I've quilted (literally) over 300 quilts, I still get nervous before I begin each one. This one, especially so! (I don't want to mess it up!) I am using the Tiara to quilt it, and so far, so good! 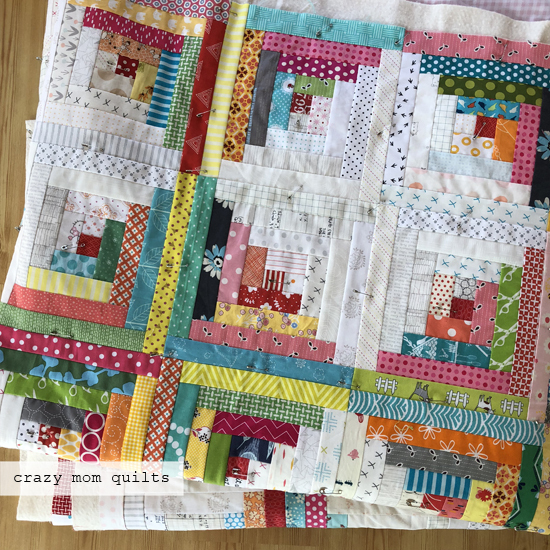 I'm quilting simple loop-de-loops and now that I've gotten into my groove, it's actually kind of relaxing. (Can you believe it???) 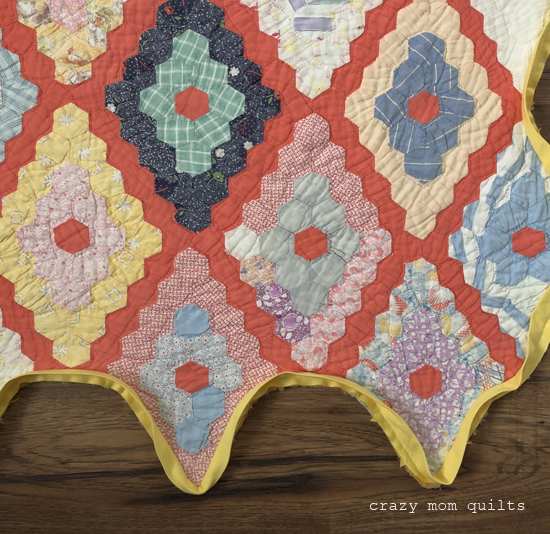 I love how the tiara foot glides over the quilt and doesn't distort the strips. That's especially important for a quilt with this many seams. 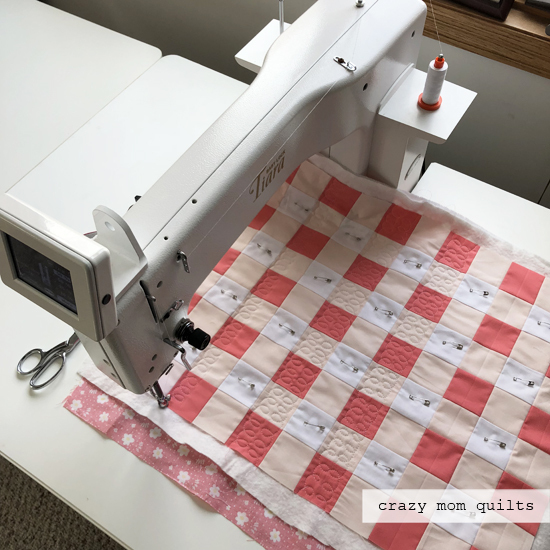 Here's a photo to show my entire quilting set up. 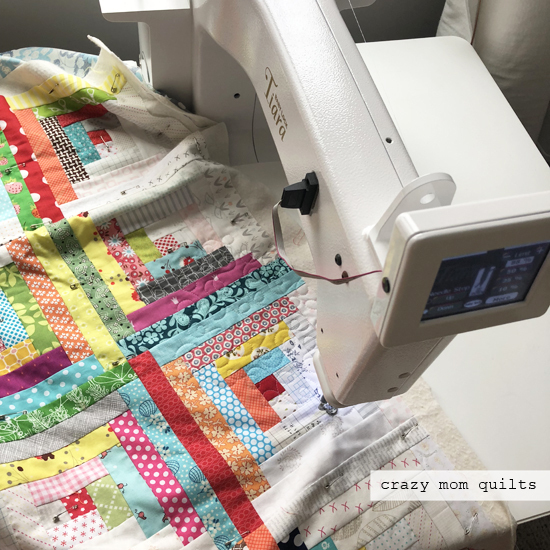 The tray table to the right holds my pin bowl, the bobbin side winder, my coffee, a sample quilt sandwich to check my thread tension, and a sewing needle to bury my thread ends. To the left, I have a few chairs to help support the weight of the quilt. 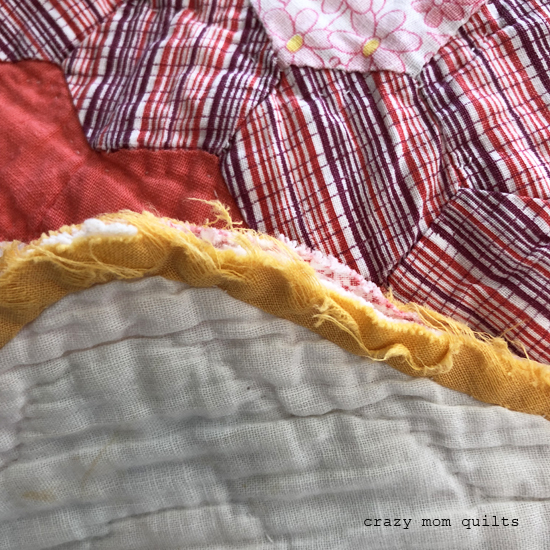 If you notice, I prefer to pool the quilt (rather than roll it) to deal with the bulk during quilting. It's much easier to manage that way. 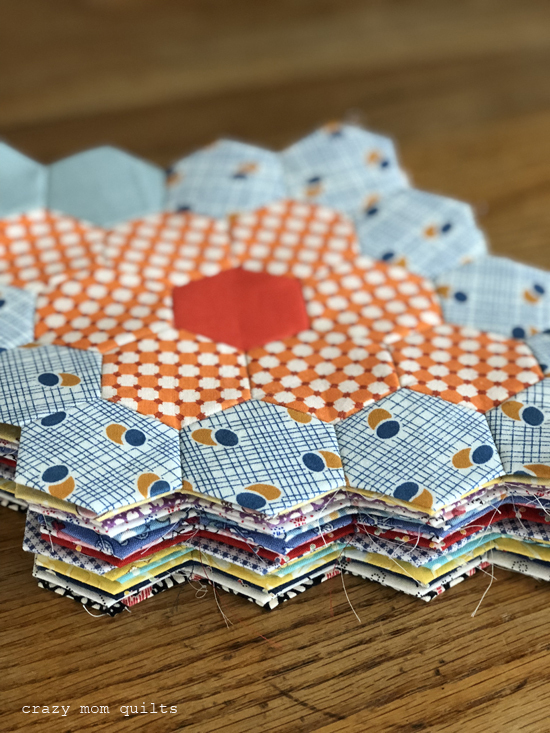 Any way you slice it, that is a whole lot of fabric to manage. The extra throat space in the Tiara is super helpful! 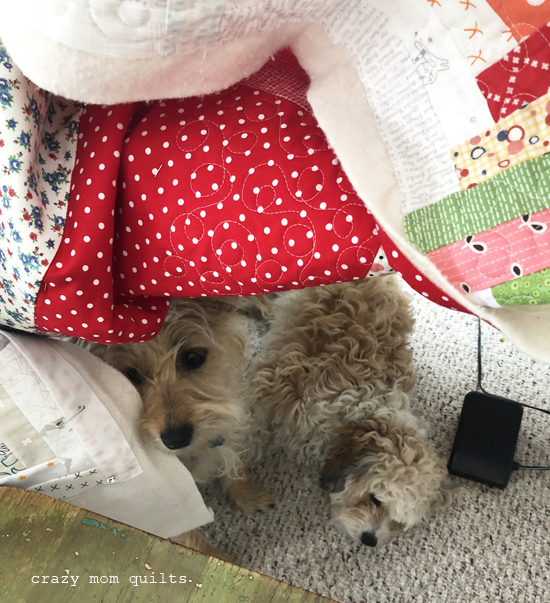 This is the situation UNDER my desk while I'm quilting. :) It's pretty cute. 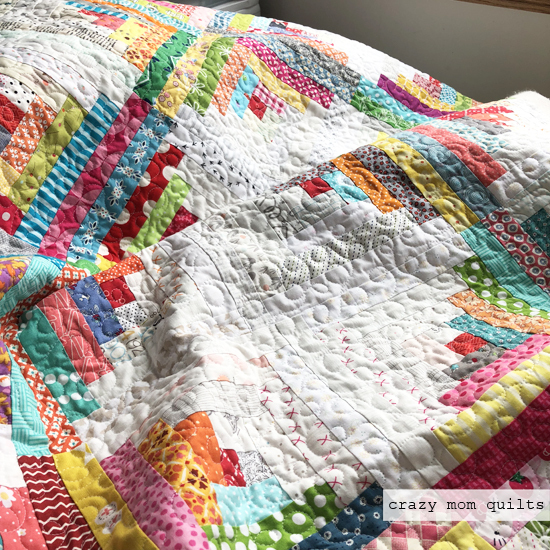 My kids are on spring break this week, so I'm not sure how much quilting I will get done, but I'm hoping for the best! 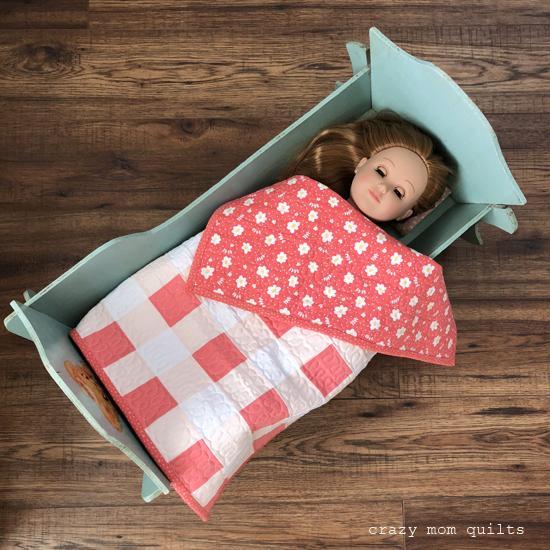 So far she made a heat pack (made from flannel and filled with corn) and she's moved on to a doll quilt. 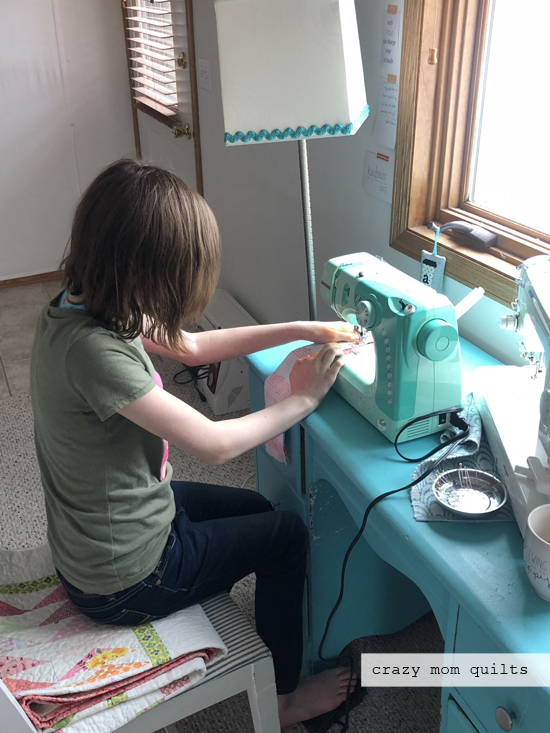 It's so fun to have her sewing!!! (I'm trying to keep my excitement at bay so I don't scare her off. Hahaha!) Hopefully I'll have more of HER projects to share this week, too. I wasn't sure what to finish this week....it seems like there is always so much to do and so little time. This hat, which was the closest project to being finished, was a good candidate. I have been procrastinating finishing the top because I was scared that I would mess it up. Turns out it took less than an hour, and it was pretty easy! Once again, I'm thankful for the accountability of finish it up Friday! I couldn't be more pleased with how it turned out! 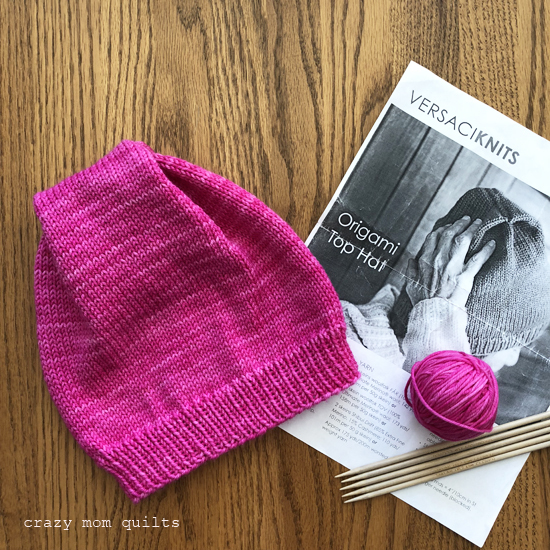 I would recommend the pattern and the yarn. It was a fun knit! Oh, I wanted to say thanks for all your input on my binding dilemma! I have a lot to consider. Thanks for your thoughtful comments! Hello! 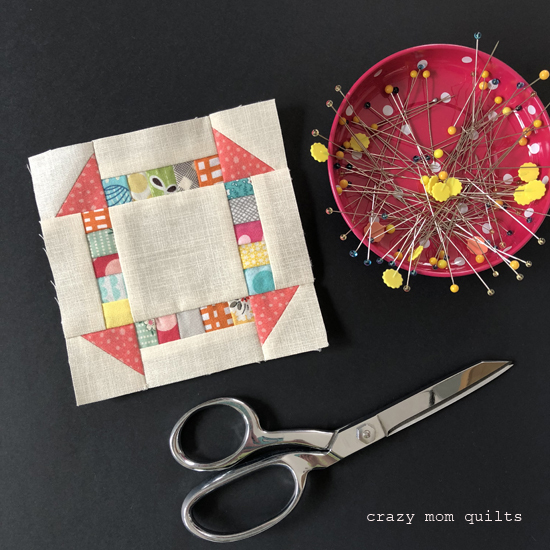 I thought that it would be fun to share a tutorial for making a scrappy churn dash block today. 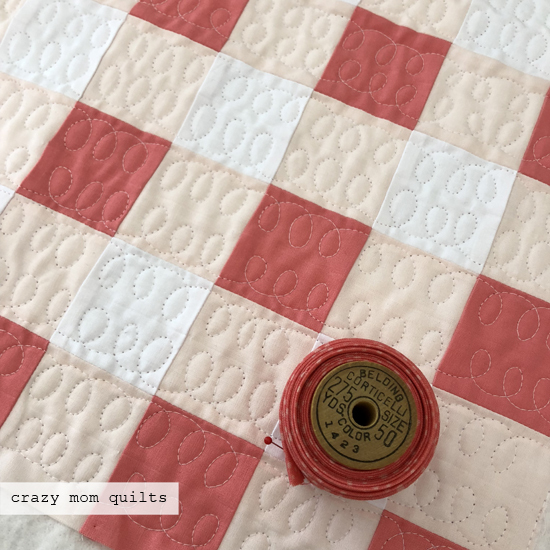 I originally planned to include this idea in my book, but I didn't like any of the versions I made while testing, so I switched gears and made the ring me quilt in it's place. 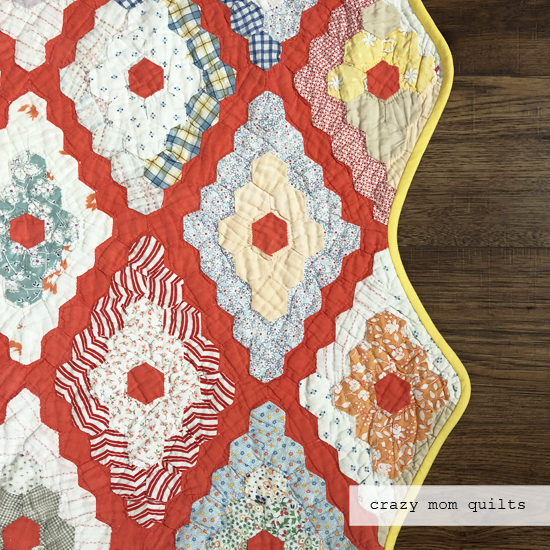 I'm glad that things worked out that way, because I adore that quilt. 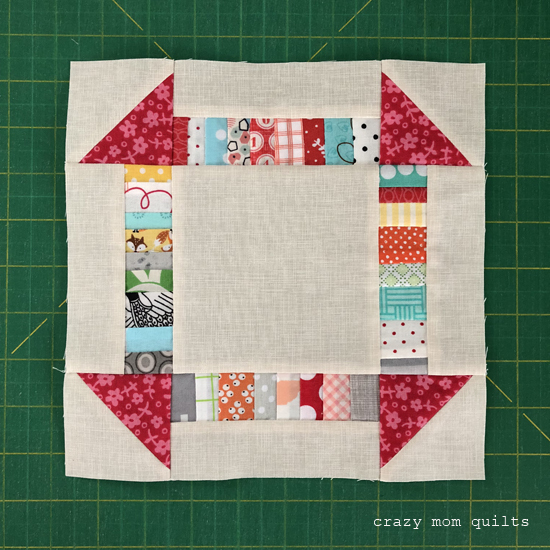 I wasn't going to give up on the scrappy churn dash block completely, so today I revisited the idea. 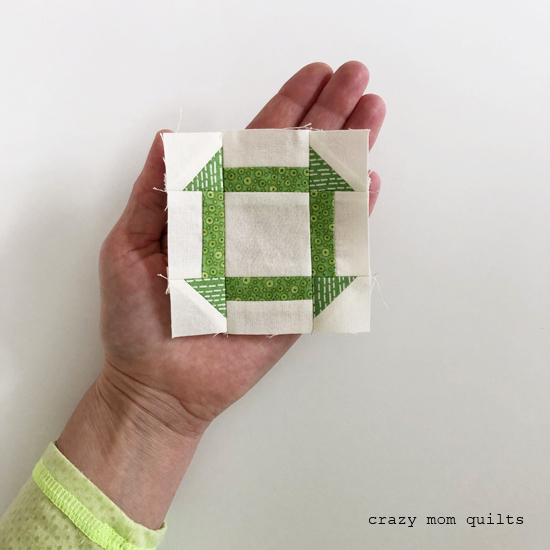 I'm pleased to report that I finally made a version of the block that I LOVE. Hurray! For the background fabric, I'm using Quilter's Linen by Robert Kaufman in the color Ecru. (I have a whole bolt of this fabric, which is very exciting!) 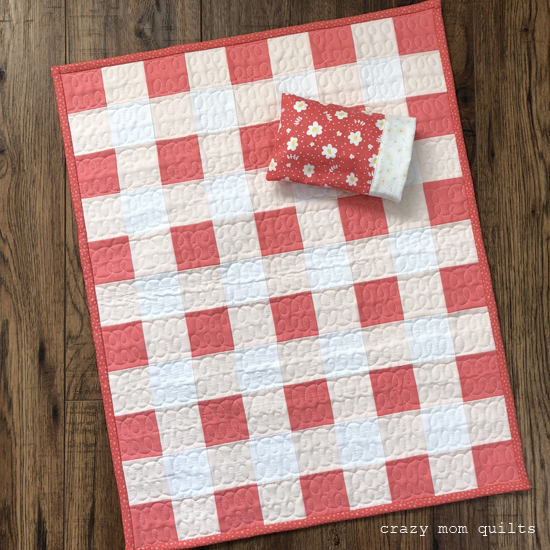 I love that it looks like Essex linen, but it's actually quilting cotton, which is easier to work with because it's less bulky. 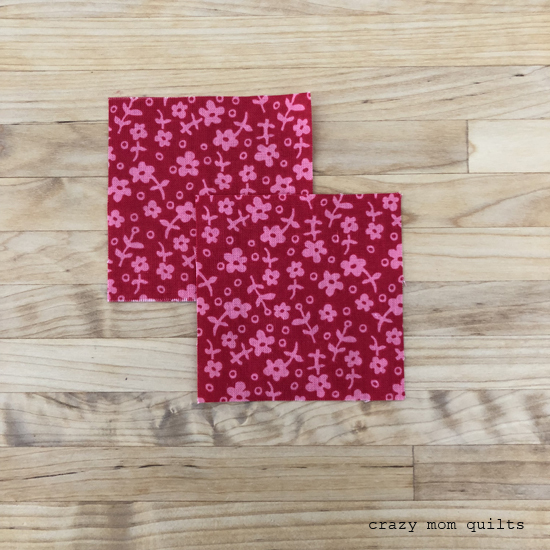 Cut each of the 3" squares in half on the diagonal once, to make a total of 8 triangles. Place one background fabric and one contrast fabric, right sides together. 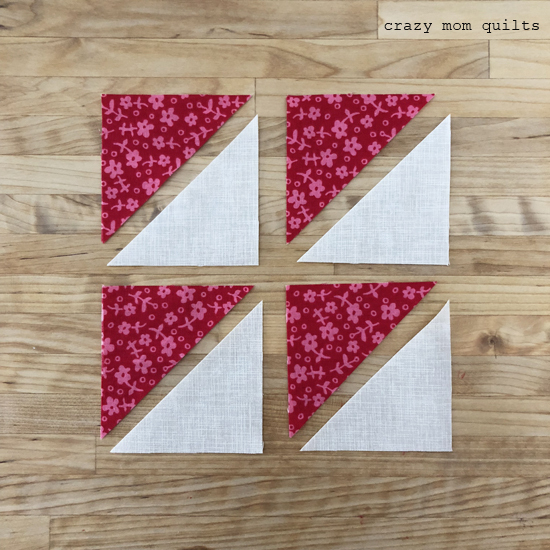 Sew to form a half-square triangle. Make 4 total. Press the seams. 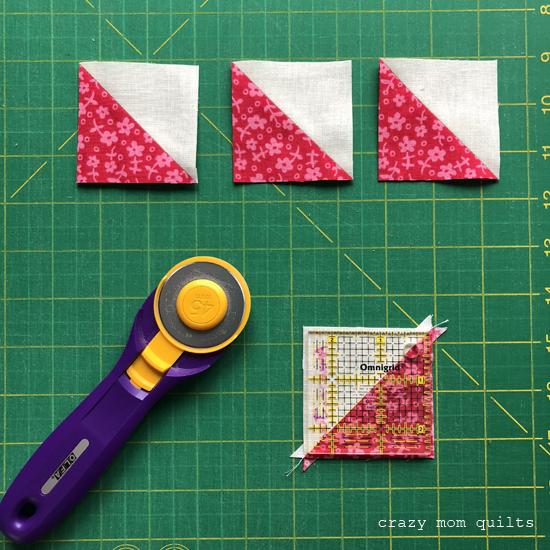 (I like to press my seams open when making half-square triangles, but you can press the fabric in any direction you choose.) 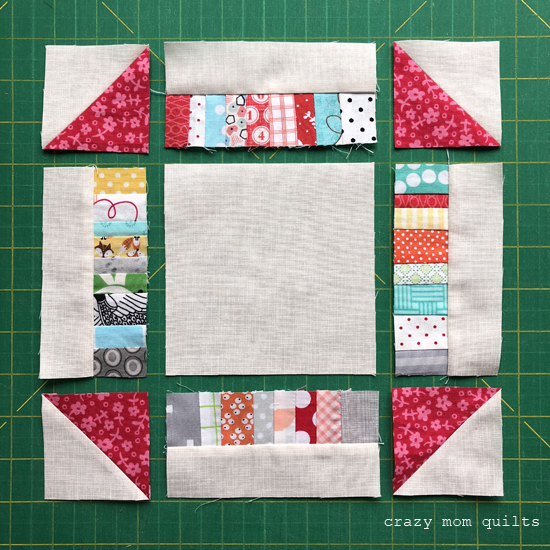 Trim each half-square triangle to 2 1/2" square. 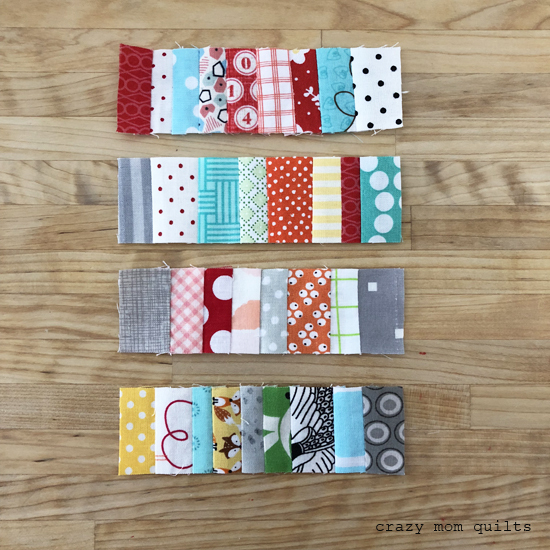 Place one strip of background fabric and one strip of scrappy patchwork, right sides together. Sew along one long side and press seam to the background fabric. Make 4 total. 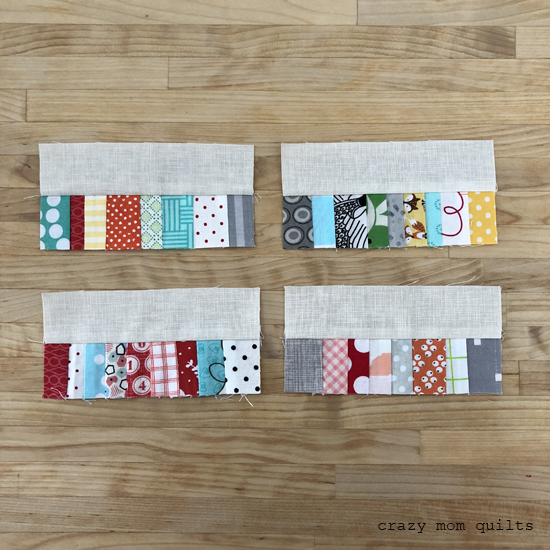 Sew the block units into rows. Press the seams in the top and the bottom rows toward the triangles. Press the seams in the middle row toward the center. 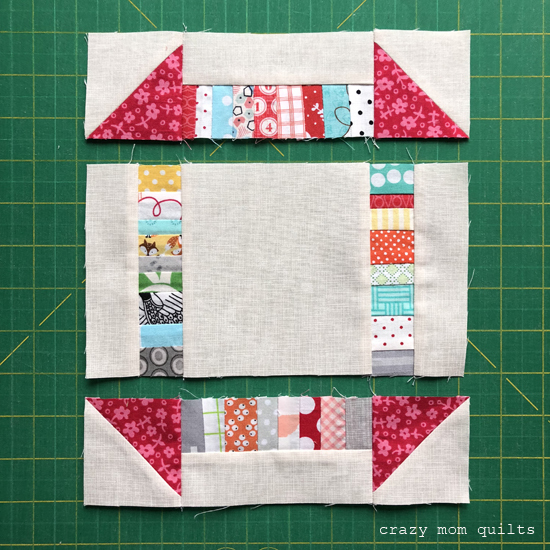 Sew the rows together to assemble the block. Press seams toward the center. The block should measure 9" square. Here are my three original scrappy churn dash blocks that I made in the testing phases. Like I said, I wasn't thrilled with any of them, but they do make dandy hot pads. 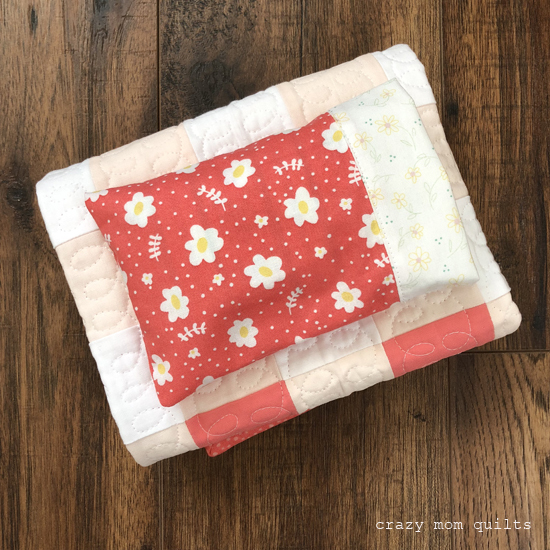 If you'd like to turn your scrappy churn dash block into a hot pad, you can use this tutorial as a guide. I like to turn orphan blocks into usable objects, because that means less clutter hanging around the sewing room. If you give this block a try, I'd love to see it. 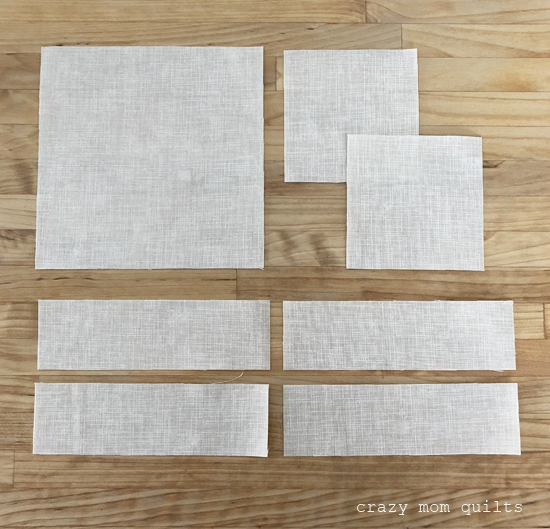 Have fun sewing up your teeny tiny scraps! 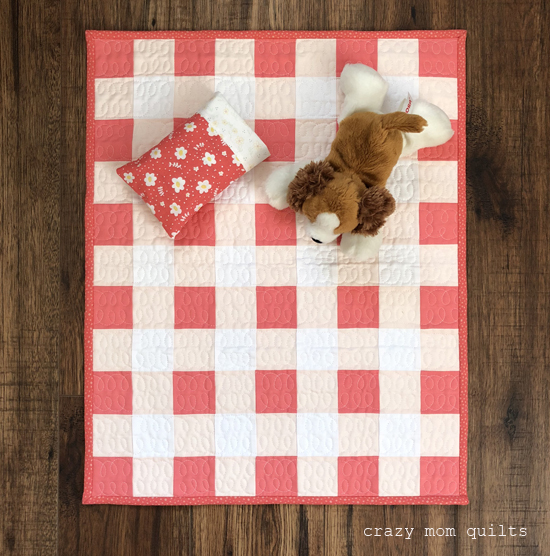 This gingham doll quilt, which is a mini version of my new king size quilt, was such a delight to make. 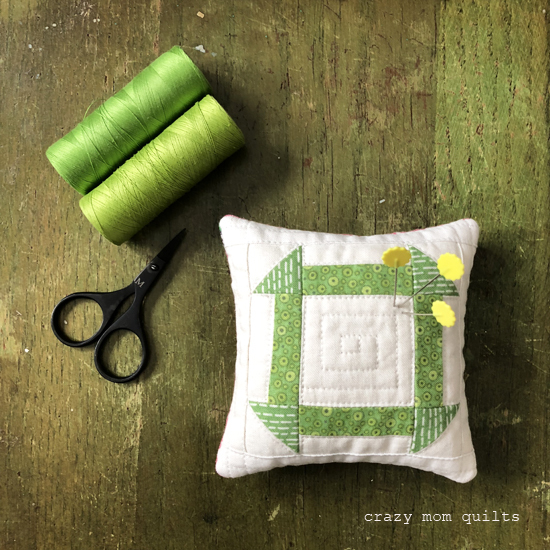 After I had finished the king size quilt, I threw all the extra scraps into a bag and stashed it in a bin. (That's a bad habit to get into!!!) 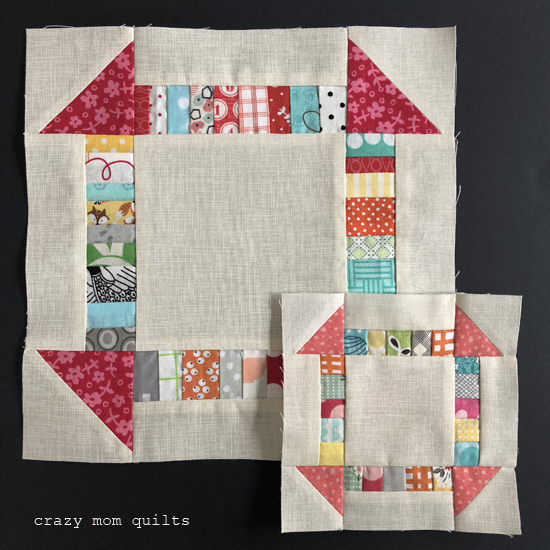 It felt so good to pull out the scraps and actually use them! 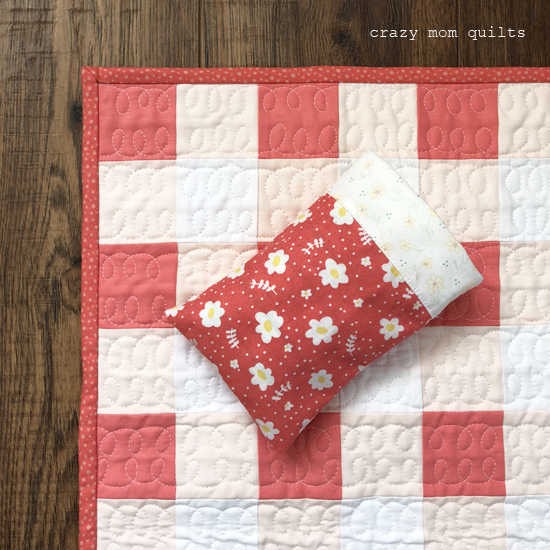 I made a teeny tiny little pillow case to match, because...cuteness!!! (I used my OLD doll bedding tutorial from 2008, which can be found here. Still works. Hahaha!) 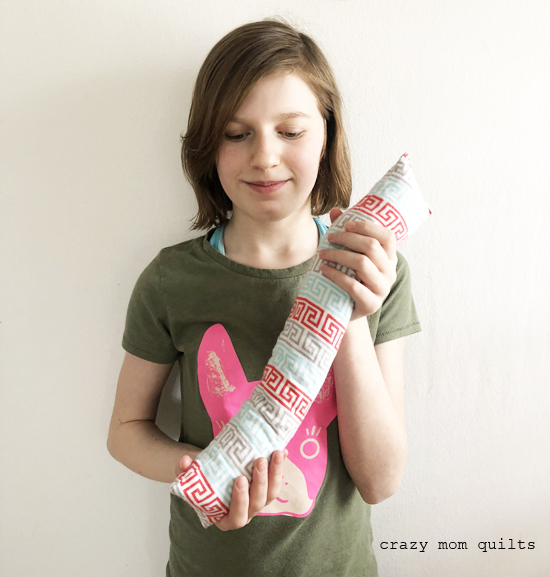 I haven't done much sewing with my Emma and Myrtle fabric since it came out, so it was nice to use it for this project. 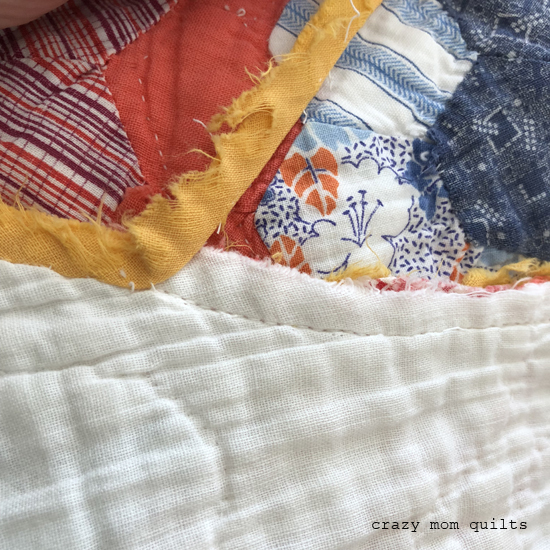 Right before I was about to make the binding, I discovered some leftover binding from the king sized quilt. Guess what? 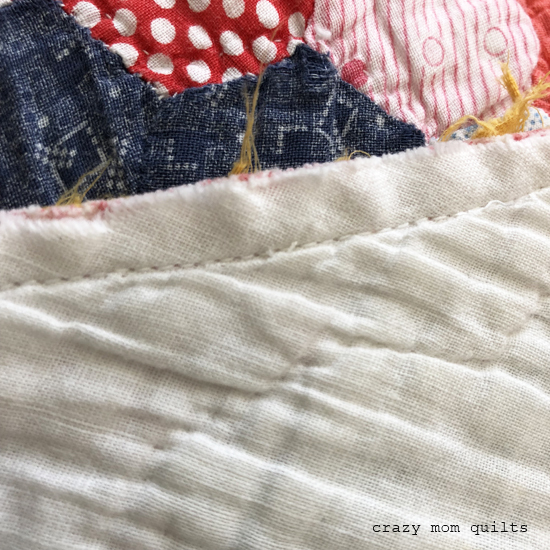 I had enough left to bind the doll quilt with about 5" to spare. It was perfect!! 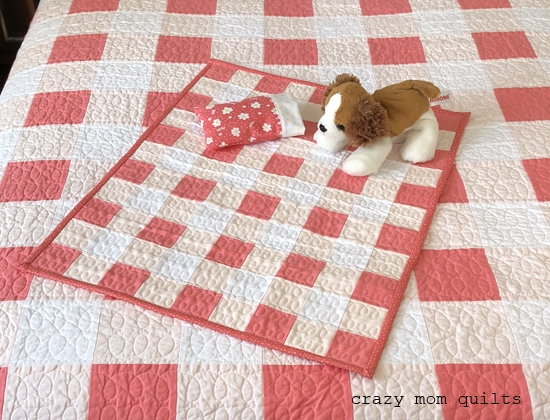 The doll quilt measures approximately 18" x 22" and it is scrap project #199!